Can we emulate nature's technology in chemistry? Through billions of years of evolution, Nature has generated some remarkable systems and substances that have made life on earth what it is today. Increasingly, scientists are seeking to mimic Nature's systems and processes in the lab in order to harness the power of Nature for the benefit of society. Bioinspiration and Biomimicry in Chemistry explores the chemistry of Nature and how we can replicate what Nature does in abiological settings. Specifically, the book focuses on wholly artificial, man-made systems that employ or are inspired by principles of Nature, but which do not use materials of biological origin. Written by a team of leading international experts, the contributed chapters collectively lay the groundwork for a new generation of environmentally friendly and sustainable materials, pharmaceuticals, and technologies. Readers will discover the latest advances in our ability to replicate natural systems and materials as well as the many impediments that remain, proving how much we still need to learn about how Nature works. 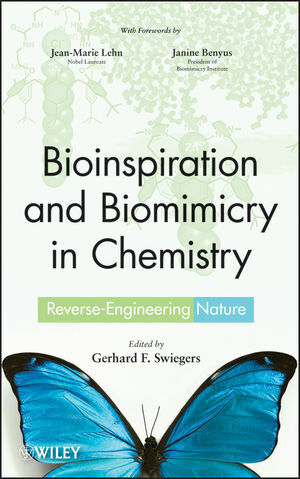 Bioinspiration and Biomimicry in Chemistry is recommended for students and researchers in all realms of chemistry. Addressing how scientists are working to reverse engineer Nature in all areas of chemical research, the book is designed to stimulate new discussion and research in this exciting and promising field. GERHARD F. SWIEGERS, PhD, is a professor of chemistry at the University of Wollongong in Australia. His research focuses on taking inspiration from and learning from Nature in fields including self-assembly and catalysis. He has authored widely cited works that highlight the similarity of self-assembly in chemistry and biology. He has also been responsible for illuminating important fundamental aspects of chemical and biological catalysis, with significant implications for the rational design of bio-inspired catalysts.